The competition prize is a pair of City End Terrace Tickets for the Liam Miller Tribute Match 25th September 2018. Entry open to current full time CIT students only. Proof of identity may be called for before the prize is awarded. Winner will be selected at random from the sign up taken on Societies Day Wednesday 19th September and will be notified via the email address/mobile number used to sign up. 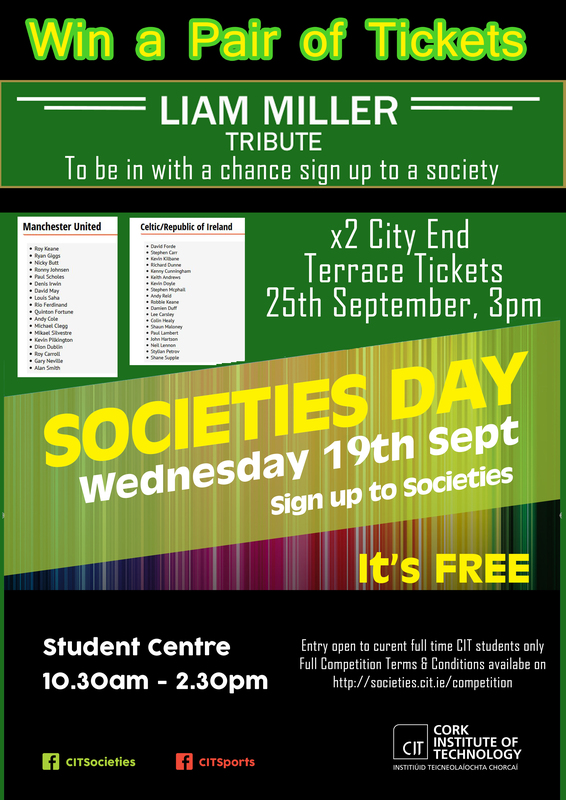 Students can enter by signing up to a society or by submitting their details at the general societies info stand. CIT Societies reserves the right to draw an alternative winner in the event that no contact has been made within a 12 hour period. CIT Societies reserves the right to cancel, terminate, modify or suspend a competition and/or vary competition rules at any time without prior notice. Accepting the prize constitutes a winner's consent to be photographed and/or videoed by CIT Soceities to use his or her name, city/town of residence, CIT course details for Competition or publicity purposes without compensation. This includes on CIT Societies and CIT website, direct and social media channels.